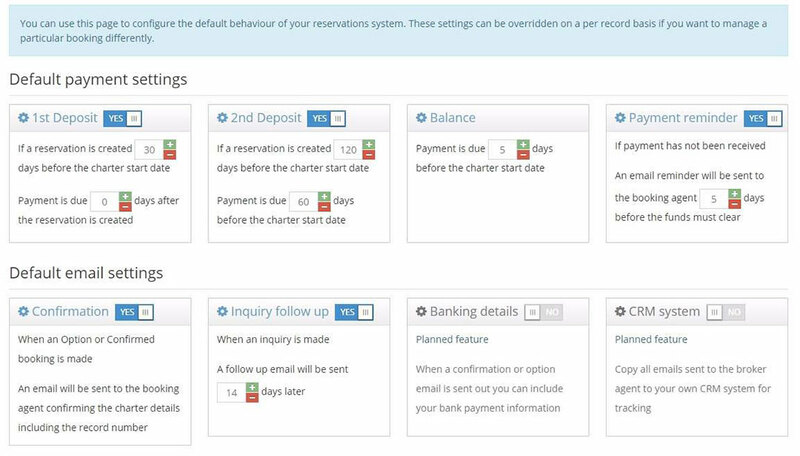 Every management company using the reservation system to manage their fleet of charter yachts has the ability to customise all the default settings to better work with their business flow. – 1st and 2nd deposits are automatically turned on and turned off depending on how for away the charter start date is, allowing the charter deposits to be broken down in to more manageable and safer amounts of money for long range charters. – Payment reminders can be sent out for all the deposits and the final balance a set amount of days before they are marked as ‘Overdue’ and would usually require urgent followup by the management company involved after they exceeded that time period. – Confirmation emails are an integral part of the system and allow the retail agents booking the charters to know that their options and confirmed charters have been accepted and are now in the calendar system for the yacht in question. – Inquiry followups allow central agents to sit back and let the system chase up the inquiring retail agent on their original inquiry and then expires them once they are considered to be deal leads.